As part of a wider project I have been looking at how to reuse the keyboards found on Thinkpad laptops. The connector for these is no longer available (at least not in small quantities), however the Molex SlimStack range appears to be a compatible fit. 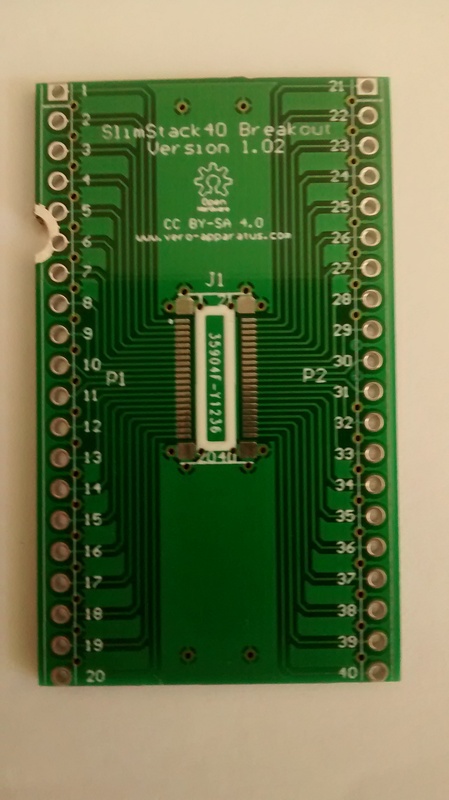 I was unable to find a simple breakout board for this series of connectors I decided to produce one of my own. 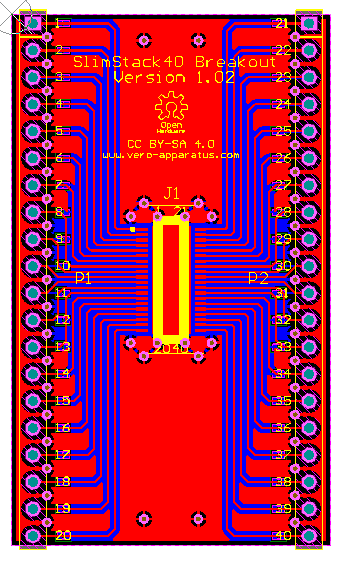 Now, I am used to producing very fine pitch PCBs as part of $dayjob, so I had to move away from my normal design rule set to something that can be built by the fabs used by the PCB bureaux that cater for the hobbiest (lets face it this is a simple connector breakout board – so it shouldn’t tax any fab plant; going to the hobby bureaux provides access to cheaper fabs that can easily cope with these simple boards, but may not be suitable for the stuff I run through with $dayjob, likewise those more advanced fabs I use for $dayjob would simply be too expensive for this kind of work). My ‘goto’ guy for this is Mitch at Hackvana, having been recommended to me by a friend, Colin (G8TMV), who has also used Hackvana for several projects, his boards are a little bit smaller than the behemoth that is OpenTAC – actually quite a complex, if only 4 layer board, that Mitch produced for me (photo). 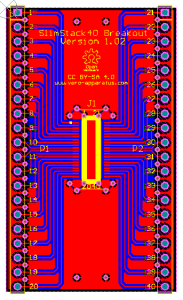 I dutifully followed the design rules posted on the Hackvana website (indeed I still owe them a set of Altium Templates but that will be another post), and emailed Mitch version 1.00 CAM files. I got a response very quickly pointing out that I hadn’t quite complied with the design rules (some of my overlay lines were too thin – turns out I didn’t care if they came out or not). More importantly though, Mitch suggested that if I shrank my board ever so slightly that the cost would be massively reduced! [That will be] USD30. They'd be USD19 if you can get them to fit within 5x5cm. 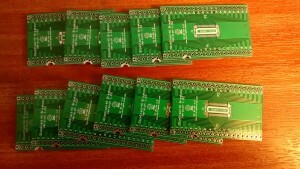 Well yesterday came and I got a message form my wife telling me that the boards had arrived. I got home and inspected them. Something looks wrong, can you spot the problem? 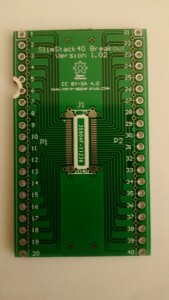 If you haven’t spotted the problem; there is a plated, arc / partial hole, on the top left of the board (all boards) that is joining the ground plane to pins 5 and 6 of the connector. Can you please send me another photo that shows the extent of the problem? I will get replacements made and shipped to you ASAP. Now that is customer service! OK it is unrealistic to expect a responce of 3 minutes, but a fast response, acknowledging the problem, and offering to do something about is what I expect, and all to rarely receive. Customers have a right to expect what they order to arrive on time and defect free. This should be the norm and so nothing of note here. However things do, occasionally, go wrong. In this case I suspect that the board adjacent to mine had a stray pad that for whatever reason got missed (at the prices I am paying it would be unrealistic to expect the fab plant to notice this – hoped for but not expected) and this encroached into the panel space that had been allocated to my board. Occasionally though, things do go wrong, and ‘Bad thing™’ happens…. Just how a company reacts in these situations is what separates a good company from the bad. 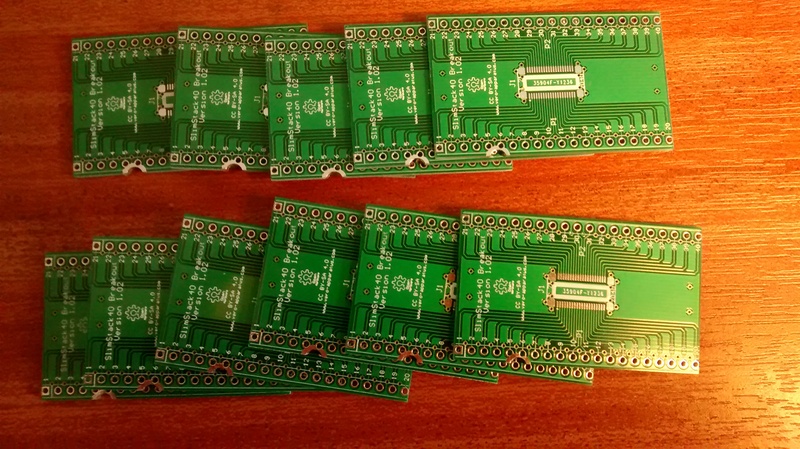 Had this been one of the faceless automated PCB bureaus out there, I suspect that I would still be trying to contact customer support, with Hackvana, however I am now awaiting my replacement boards happy in the knowledge that they have seen the problem and are putting it right. Of cause what separates a good company from a truly excellent one is that they put measures in place to stop this from happening again… Only time will tell on that front, but for now, even though I still don’t have my boards, I’m still a happy customer.